It's not fully visible, but what can be seen is spelled correctly, except the whole thing is written backwards. Most likely a copy/paste Photoshop accident. I've said it before, and I'll repeat for the newcomers: Never trust Photoshop with your Hebrew, as it always reverses Hebrew. Some of the other image and text editors can do that too, so it's always recommended to verify before inking. Just post your image on Yahoo! Answers and ask what it says. If you got it wrong, you'll be told so. 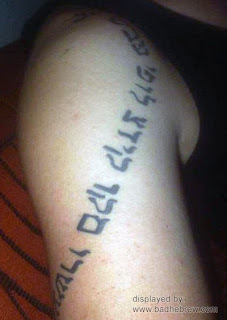 plus, it is tattooed upside down (assuming this is a human arm and shoulder we're seeing). Actually, there is something admirably sweet about a guy who designs his tattoo to be readable by dyslexics standing on their heads. Kol ha'kavod. ('All honour', or more colloquially, 'Way to go, guy."